The fifth round of F1H2O World Championship is all set to be held for the very first time in Amaravati, the capital of Andhra Pradesh. AP Tourism Authority is hosting this grand event that will put the people's capital on the world map soon. The team which last raced in 2004 in Mumbai is making a comeback after a decade plus long hiatus. River Krishna will see some extreme action on 17th and 18th of November, which will become a talking point for the world of sport. The international team and drivers are particularly excited about racing on the waters of River Krishna. The team is now actively coordinating with India Xtreme Adventure Activities Private Limited of Malaxmi Group, who are the local partners of F1H2O. Due reconnaissance has been conducted in the matters of logistics and planning along with AP Tourism to establish appropriate arrangements with ground plan and layout. Marco Pietrini, Director of Logistics has arrived in the city to work closely with the teams. He is elated about this association and finds Amaravati a vibrant place for sporting activities of this magnitude. Paolo Di San Germano, President, F1H2O Racing said, "We are very excited that the fifth round of the 2018 UIM F1H2O World Championship will take place in India for the first time since 2004. We would like to thank the Government of Andhra Pradesh who right from the beginning believed in the realization of such a big project. For this reason, we really appreciate the great effort done by the local partner India Xtreme (Malaxmi Group), N Chandrababu Naidu, Hon'ble Chief Minister, Andhra Pradesh Tourism committee and all the people involved. Till now, the Indian state of Andhra Pradesh and its capital city of Amaravati actively contributed to support H2O Racing with hard work, sponsoring activities, initiatives of urban regeneration and environmental improvements. We already reached a large audience and the numerous supporters who write us to have more in-depth news regarding the upcoming Grand Prix of India, a tangible proof of such a huge teamwork. Moreover, there will be two dedicated boats representing Team Amaravati participating in the competition and we think this is just the cherry on the top of an event that can realistically be supposed to be an outstanding and leading-edge show." Jonas Andersson, Lead Driver, Amaravati said, "As a driver of Team Amaravati, I can only be enthusiastic and honoured that the city of Amaravati has decided to focus on me, on my teammate Erik Edin and on my whole crew for being represented in the 2018 UIM F1H2O World Championship. I’m very happy that India will host the fifth round of the Championship, regarded as one of the most spectacular and exciting sports in the world. It will be our first time there and we all have high expectations of the event. We must be focused on the race and push to the maximum, we have been working very hard in the last months to improve our performances and secure the best result possible, we are eager to race in the waters of river Krishna and we want to do our utmost to win and honour this wonderful country. At the same time, we would be very happy if in the near future Team Amaravati will grow thanks to some ambitious Indian youngster who wants to join the team and compete in the F4-s World Championship. In the meantime, let’s keep fingers crossed and long live Amaravati!" Nicolo’ Di San Germano, Promoter, F1H2O Racing, added, "We have worked very hard to bring back Formula1 to India and thanks to the strong effort of both H2O Racing and the Government of Andhra Pradesh we can now announce with great pleasure that a big project such as the 2018 UIM F1H2O World Championship will be hosted in Amaravati, the new capital of Andhra Pradesh. We truly believe that Amaravati is the ideal location for power boating and we are sure that this event will constitute a highly positive effect on the development of India and on its tourism industry. The F1H2O family hopes also that from now on we will start a long lasting period of powerboat racing in India, that will help to further expand the World Championship’s global fan base and, at the same time, will give Amaravati’s spectators a unique and breath-taking experience. On Friday the 16th of November the F1H2O powerboats will have a free practice session. On Saturday the Qualifying session will see the teams battling for pole position, while on Sunday afternoon the Grand Prix of India will start after another session of free practice and a spectacular parade lap. We look forward to welcoming visitors from all over the world for what will no doubt be a thrilling show." 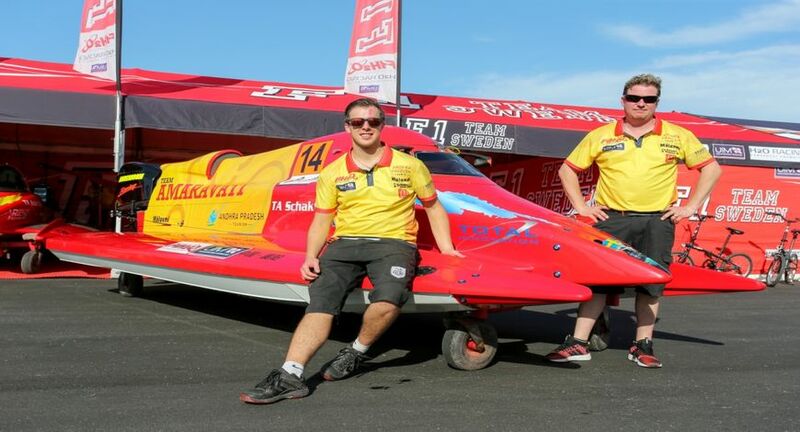 Marco Pietrini, Director of Logistics, F1H2O Racing said, "From the moment we landed in Amaravati we were pleased to receive the best hospitality from the people here. They are so warm and welcoming. Amaravati is a vibrant and energetic city with lot of existing modern infrastructure. The local people can praise themselves for living in one of the cleanest cities of India. It is exciting to be a part of this race edition and work to promote a city like Amaravati. The local organising committee of the F1H2O Grand Prix is striving to publicise the event, enhancing water sport culture awareness in the region, supporting charities for local fishermen in line with the concept of sustainability that is one of the foundation of the Amaravati development project. We have great expectations and I can't wait now to see how the race site will take shape in the next days. I am sure that our local partners will put their maximum efforts to make the F1h2o Grand Prix of Amaravati the most spectacular one of the 2018 season!" F1H2O World Championship 2018 will be held in Amaravati on the waters of River Krishna on 17th and 18th of November.